The research group Neurogeriatrics Kiel prioritizes on the collection and analysis of quantitative data from modern technological tools. We believe that the future of medicine will include such data in the diagnosis, monitoring and care of patients. We focus on the elderly with mobility and movement disorders and cognitive restrictions. 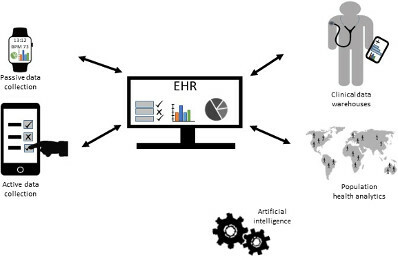 The future of digital medicine will most probably be based on multiple interoperable electronical databases, with the patient-controlled electronical health record (EHR) in the center. Passive and active data collection devices will be used by the patient and continuously feed data into the EHR. (Note that the watch in the figure stands for many different data collection opportunities, including non-body-located systems.) Clinical data warehouses are databases that will support medical professionals with clinical decision making and patient care in real time. Population health analytics will support health-related decision making by providing risk and prediction markers. Analysis strategies within and across databases will be mainly based on artificial intelligence algorithms. Our group is working on the development and validation of algorithms for the quantification of movement and mobility in the elderly and Parkinson's patients. Data is processed from so-called wearables. Other algorithms are currently being developed and validated by the working group. Our ultimate goal is the development of clinically relevant parameters for use in the clinic, in the doctor's office and at home. The aim is to measure diseases, their progress, and their response to therapies. We also support the development of an algorithm platform for sensor-based data, e.g. to cross-validate existing algorithms. The developed algorithms are used continuously in national and international cooperation projects for the detection of movement and mobility in the clinical and domestic environment. Ein Beispiel ist die ComOn Studie. The EU-funded Horizon2020 project FAIR-PARK 2 uses our algorithms to determine exploratory endpoints. The randomized, double-blind, investigator-initiated study led by Prof. David Devos, Lille, France, is investigating the effect of an iron chelator on the progression of Parkinson's disease. In the process, some of the study participants wear three small sensors on the body over several weeks in order to be able to define movement and mobility in more detail. The sensors were developed as part of an earlier EU project led by us(www.sense-park.eu/). KEEP CONTROL is a Horizon 2020 ITN project. It consists of an EU-wide consortium of experts from the clinical, biomechanical and neuroscience environment, and is leaded by Kiel. The goal is to better understand and treat the gait and balance problems of older people (www.keep-control.eu/). Gait and balance problems are widespread among older people and lead to an enormous burden in their personal and professional life as well as in health care. The treatment used today has little influence on the problems mentioned. Key questions about basic mechanisms and treatment options are still unclear. TREND is a longitudinal study of more than 1100 elders that investigates motor, cognitive, and many other skills in great detail. The participants receive a detailed sensor-based examination protocol for recording everyday relevant movements. In particular, the study examines whether and how, in the years prior to onset, e.g. Parkinson's or Alzheimer's disease can detect changes that may ultimately allow for earlier diagnosis. The study can also answer other questions, such as: Aging aspects and course of cardiovascular risk factors. The study started in 2009 and participants are regularly examined every two years.